OSWEGO, NY â€“ At Thursdayâ€™s Oswego Sunrise Rotary meeting, Neal Smith presented a program on the uniforms and equipment used by soldiers of the American Revolution. 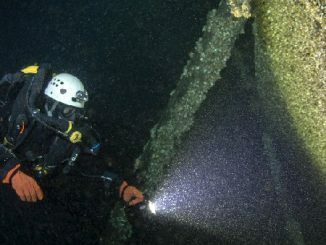 Neal is a member of Continental Arms and Collectorâ€™s Association. 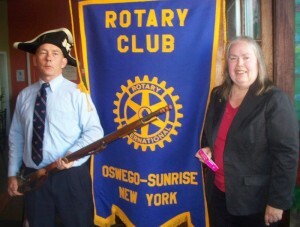 Neal Smith displays his musket as Sunrise Rotary President Carol Reed looks on. The group interprets the life and equipment of troops that fought in the American Revolution. He displayed uniform parts and explained how each was used. His unit represents a member of the regular Army near the end of the war, at about 1782. These troops were the best trained and equipped in the American Army. Nealâ€™s unit is dressed in buff and blue of the New York line. He explained how to load and fire his brown bess musket. American troops used to fire three shots per minute with little accuracy. On this Fourth of July weekend, it is well for all of us to remember the sacrifices made by the men and women that built our country. Many of those people gave all they had to give us the freedom we enjoy.